A key requirement for economic prosperity is the safety and security of lives and property. Insecurity eats away at the foundation needed to maintain modern society. This loss of confidence in the ability of government to protect citizens can lead to reduced economic activity and gradually paralyse a nation. Perception is powerful, but the shadow of a thing may not be congruent with its manifestation. In Nigeria, as in most places, the terrorists and their sympathisers are in the minority. Ordinarily, they should be the ones running scared. Why do they hold a nation and its army hostage? Something needs to change. We can out-think, outwit, and defeat these vagabonds; with a different mindset. To protect the lives and property of the law abiding majority, a new strategy is required. One that involves the common citizen working together with security services. That synergy is the key to our survival and success. We need new strategies, tactics and tools to deter, contain and neutralise enemies in our midst. Such strategies recognise that “security is everybody’s business”. Ultimately, we stand or fall together. The CIA says that the combination of ignorance and poverty make for fertile grounds in which terrorist rhetoric thrives. One should add a few more key ingredients. Long standing failure of states to provide succour to the disadvantaged; extreme disparities between rich and poor, and extravagant displays of wealth & power. But most important of all, the ignition agent: demagogues that incite common citizens to violent action and the ideological or opportunist terrorists that stir up and thrive on xenophobia. 2016. Roaming criminals attacked the Godogodo community in Kaduna state between the 24th-26th September and killed about eight persons. Suspected militants stormed the premises of a school in Igbonla, Lagos state, kidnapping two staff and six students on the 6th of October. Soldiers killed three suicide bombers who were attacking a neighbourhood near the Maimalari barracks in Maiduguri on the 11th of November. Suspected terrorists murdered twenty Tiv farmers during a raid on their village in Taraba state in December. All of this is aside from ongoing battles with Boko Haram and the Niger Delta Avengers. 2017. The battle shifts to the east side of the middle belt, with over 100 attacks by Boko Haram alone. 2018. Escalation and increased brutality in Maiduguri, Damboa, Jos, and several other places. Numerous assaults, various locations, differing methods, and a plethora of malcontent groups. Confronting all these is an army of less than 100,000 able-bodied persons and an ill-equipped, poorly resourced police. It is no wonder that security appears to be a despairing cause to many citizens. Other African nations facing internecine violence have suffered disruption for years, with limited success on the part of the authorities. Despite changes in the political order and some reforms in the army, the last two decades have been marked with blood. But could this be the darkness that precedes dawn for Nigeria? Citzens in the troubled spots do not see any light at the end of this dark tunnel. Many blame the government for indifference; even complicity. Recently, a General from the middle belt, T.Y. Danjuma, accused the army of collusion. That is unlikely. The Nigerian armed forces have only just gotten the upper hand in the fight against Boko Haram. It would be unthinkable that they would condone or cooperate with another anti-state group bent on wreaking havoc. One must not forget that the killers have not spared any religion or tribe, neither soldier nor civilian. The violence has not discriminated, even though media coverage may suggest otherwise. Objective analysis shows an evolving, dispersed, almost random nature to the attacks. This could be due to the constitution of the marauding bands: a mix of ideologists, avengers and opportunist criminals. In Nigeria, one should add impetus from power hungry politcians who see even their own kin as pawns. This blend of protagonists and motives complicates the predictability of the next assault. Conventional strategies could never cope. Most security and response systems are organised centrally. They are often led and controlled by a homogeneous group. The reporting and control systems are hierarchical. Reaction times are sub-optimal, and change is slow and difficult. This is the inherited Western approach to security systems and anti-terrorism. It has had limited success. In contrast, the threats from terrorists are dispersed. Authority is federated. Collaboration lacks fixed hierarchy, and the composition and modus operandi of groups changes rapidly. Despite considerable losses, their occassional hits that make all the headlines. Those successes have great drawing power on young minds that are on the edges of society. We can, and must stop this cycle. The same actions will result in the same outcomes. Wholesale importation of anti-terrorist startegies is foolish. Rather, Nigeria must learn from the successes and errors of others. Security thinking must be empathetic to the context and nature of the threats that we are faced with. We understand that the rapidly evolving formation and action of the terrorists is too much for our army and police. Therefore, to get a different outcome, citizens must be mobilised to help the fight. Our strategy must place community at the heart of national security. We must seek to mobilise as many ordinary people as possible in a constant lookout for national and communal safety and survival. This strategy is simple and easily understood by any adult. The descriptions that follow clarify the role and interactions of citizens and security forces. A Target is a potential focus of attack; the main types being persons, infrastructure, and property. A Perimeter is an area around a Target. It is to be kept safe, and could be a street, square, village, shop-front, roundabout, mall, town, office, etc. The Status Quo is the last-known safe state or default safe state of a Perimeter. It includes detailed, verifiable information about the appearance, infrastructure, property, persons and relationships within the Perimeter. An Agent is a recognised person or group that monitors a Perimeter to ensure that the Status Quo has not changed. The Agent normally resides or works within the Perimeter and knows about Target(s) therein. A Device is an approved instrument used by an Agent to monitor, secure, or report on changes to the Status Quo in a Perimeter. Not every change is bad. But it is important that the agent is aware, or can detect the change, and evaluate if it is safe or not. A Contact is a person or group that an Agent communicates with on a designated medium (phone or others such as social media) to give updates on the Status Quo. A Vector is a person or group of persons that have been identified, by profile or identity, to be a potential danger to one or more Target(s) in a Perimeter. A Weapon is any instrument used by a Vector to attack Target(s) within a Perimeter. A weapon is not always incendiary; it could be misinformation. The previous section should have made it clear that the 1st to 5th terms relate to the citizen, and the 6th (Contact) relates to the security services. The 7th and 8th relate to the terrorists or attackers. The next thing to think of is how/when they interact. For this, we should introduce some dynamic terms: Risk, Threat, Breach and Alarm. • Conjecture – usually hearsay, rumour, unconfirmed. Often these are outsiders who take a chance if they spot one. • Information – publicly available, widely distributed, generic. These are mostly outsiders, but with a keen interest in a Perimeter; or violence generally. • Intelligence – contextualised, detailed, timely. These are often insiders, or outsiders working with help from person(s) within the Perimeter. A Threat is the presence of a Vector within the area defined by a Perimeter; this is irrespective of Weapon(s). The assumption must be that a Vector’s intention while in a Perimeter is either to prepare or launch an attack. A Breach is a successful attack by a Vector on Target(s) within the Perimeter; this is an outcome that the strategy aims to prevent. An Alarm is the communication by an Agent of a Risk, Threat, or Breach regarding the perimeter for which he/she is designate. An Alarm should not normally be raised by non-agents. If it is, an agent must be required to validate it. I hope it is becoming clear that this is a simple strategy, and most of the focus is on the common man/woman. That is important! The synergy of community is more potent for detection and interuption of violent attackers. Members of the community have better knowledge of their environment. Given basic information/training, they can detect suspicious changes easily and much faster than formal security structures. With the right communication channels, they can alert response teams quickly, accurately, and continuously. All well and good. What does day zero look like? How does this all work from day to day, and what will the process be in the event of an incident? 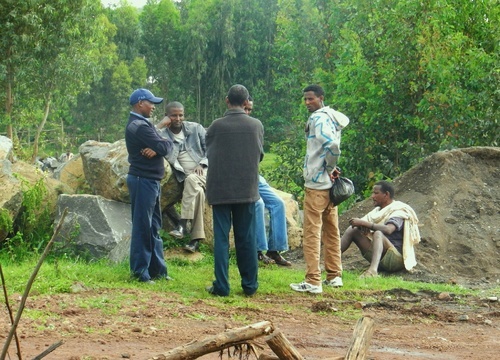 In the next article, I will be explaining how the community actors interact with security agencies. How and when an Alarm is raised, and the chain of events that should follow thereafter. The first purpose being to communicate, locate, isolate, neutralise and clean up an incident. The second, to secure the peace and restore confidence in the security services and the community as a partner for national security.